Along with the kettlebell swing, the kettlebell squat is a huge exercise for hitting all those large muscle groups. Hitting these large muscle groups means a greater hormonal response along with metabolic effect. In other words, great for fat loss and strength building. The Squat can be categorized as a pushing exercise, and so can be paired with the kettlebell swing for a dramatic effect. Most people do not Squat well. The ability to squat well requires adequate stability, mobility, strength and movement patterning. Taking the time to work on these important squatting aspects will pay huge dividends for your squatting and ultimately your results. Squatting is one of our fundamental movement patterns. Whenever you sit down or stand up you use the squatting exercise. If you drive a car then you need to squat and twist in order to get into the car. As a baby the squat is one of the main developmental movement patterns and watching youngsters move demonstrates how beautifully we all squat at a young age. Squatting opens and closes the joints of the ankles, knees, hips, and lower back, pumping and flushing valuable nutrients into the joints. Finally, you use up to 600 muscles with every squat movement you perform, that makes it perfect for fat loss and overall strength building. The squat is quite possibility the most important exercise you will ever perform. In simple terms the kettlebell squat takes the bodyweight squat and loads it with a kettlebell. It is very important to realise here that squatting with a kettlebell is no better for you than squatting without a kettlebell if you cannot squat properly in the first place. It is important to note that if you do not squat deep enough (thighs at least to parallel with the floor) then you are not engaging your backside correctly. Shallow squatting will only work your quads (thighs muscles) and not the largest muscles in the body your Glutes (backside). If you do not want big thighs and a flat backside than squat deep! If you find that squatting nice and deep causes you problems then you can program and strengthen the movement pattern by using a resistance band. Try some of these hip opening exercises to help improve the depth of your squats. I usually recommend that you are able to perform 20 non-stop bodyweight squats before moving on to the kettlebell squat variations below. The Kettlebell Goblet Squat is the best starting point for adding load to the squat. Hold the kettlebell upside down and by the handles. Allow the kettlebell to rest against the chest if needed and keep the arms tucked in. Practice: work up to 20 perfect repetitions moving smooth and steady. Next a similar squat variation to the goblet squat. Hold the kettlebell in both hands with the handle pointing upwards. You will find it easier holding the kettlebell by the body rather than by the handle in this position. As you get stronger and more comfortable with the movement you can add a press into the top of the exercise (see image above) to increase even more muscle activation. Practice: work up to 20 perfect repetitions before adding the press. 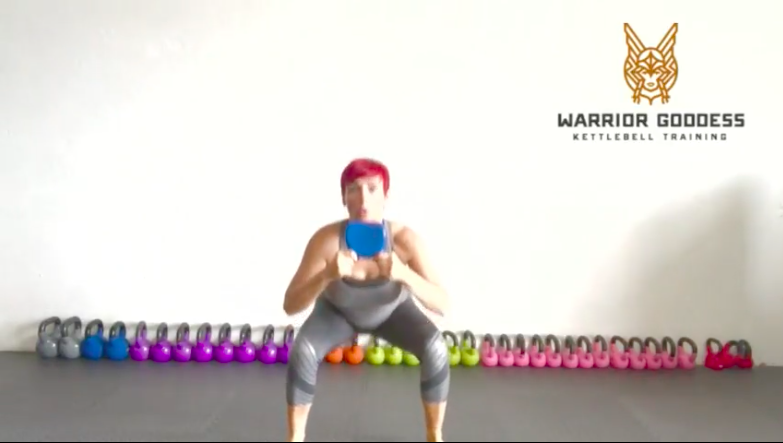 Now we move on to the single handed variation of the kettlebell squat. You will create an imbalance and rotation through the body by holding the kettlebell one handed and against the chest. The racked kettlebell squat allows great transitions from one position to the next but does mean that you will need to squat equally on both sides. As the arm starts to fatigue you can always use the other arm just to steady the kettlebell and help out a little. Practice: progress to 10 repetitions on each side and 3 total sets. Once you have mastered the racked kettlebell squat above you can add even more muscle activation and cardiovascular demands to the movement. As you drive up from the bottom of the squat continue the momentum upwardsand press the kettlebell overhead. The thruster is a very demanding exercise so don’t progress onto this exercise until you have mastered all 3 of the squat variations above. Practice: work up to 60 seconds non-stop on each side. Tough on the cardio! Now the kettlebell squatting exercises are getting a lot more advanced. Holding the kettlebell permanently overhead while you squat requires excellent mobility through the upper back and shoulders. Keeping the arm over the head makes the heart work harder too as it pushes the blood uphill. Practice: 12 well performed repetitions on each side is a great achievement. Practice: Add this into a Tabata Round. The most difficult of the kettlebell squat variations. The kettlebell is held with both hands but the squat is performed on just one leg. The kettlebell will act as a nice counterbalance during the movement but does add additional resistance to the movement. You should practice the movement first without using a kettlebell. Using a resistance band or TRX as demonstrated earlier is a great way to build up strength and mobility in the movement. Practice: try a strength ladder, 1 on each side, then 2 on each, then 3, 4 and 5. Just to show you how you can incorporate the kettlebell squat into your kettlebell workouts I’ve included a few 4 minute workouts below. The workouts last a total of 4 minutes and can be completed a total of 3 times with a 30 – 60 second rest in between. The kettlebell squat is one of the most important kettlebell exercises that you need to use. Squatting with a kettlebell helps to improve your joint health, uses 100’s of muscles in one movement, is very cardiovascular and is a great fat burning movement. Ensure that you are great at squatting without a kettlebell before loading the movement pattern. You can use a resistance band to help improve your squatting skills and strength. Once you can squat well you can use one or two kettlebells and also nicely transition from one exercise to the next without putting the kettlebell down. Great for keeping your heart rate elevated. Take your time, progress carefully and logically and the rewards will be well worth the effort. You can use my follow along workouts above to help understand how the kettlebell squat fits beautifully into your workouts.